How to Watch TNT Without Cable - Your Top 4 Options. 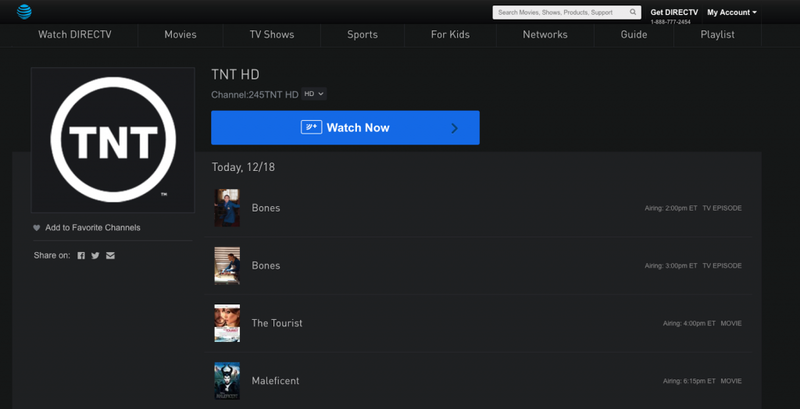 How to Watch TNT Without Cable – Your Top 4 Options. If you’ve cut the cord and canceled your cable subscription, you may be wondering how to watch TNT without cable. TNT broadcasts NBA games and quite a few popular shows, including Rizzoli & Isles and The Last Ship. Here are your best options for streaming TNT through the web. Skinny bundles like DirecTV Now and Sling TV offer a handpicked selection of cable channels for a set monthly fee – without a contract – making them very popular among cord-cutters who want to keep their live cable TV channels. Here are all of your options for watching TNT without cable via skinny bundle services. Sling TV is definitely the cheapest way to stream TNT without cable. Sling TV is not perfect – mostly due to its confusing “package” options – but it’s still a really good choice if you need to stream TNT at a low monthly cost. There are two options for streaming TNT with Sling TV. The first option is the $25/month “Orange” package. This is the cheapest option on our list. With this package, you will get TNT, as well as AMC, TBS, IFC, Comedy Central, and ESPN. You can see our full channel breakdown for more details. You may be wondering how Sling can offer all of these channels for such a low rate. Well, there are a few caveats that you should understand about the Sling Orange package. The biggest issue is that Sling Orange package only allows you to stream on a single device at a time. If you’re only interested in watching TNT on your own, this is fine. However, if you intend to share your account with family members, it’s incredibly limiting. If you’re streaming, nobody else can – and vice versa. If this is a dealbreaker, there’s another option. You can get Sling Blue for $25/month – it also includes TNT, as well as some channels that are missing from the Sling Orange bundle, such as Fox Sports channels, USA, and Bravo. With Sling Blue, you can watch on up to 3 devices simultaneously, making it a much better option if you plan on sharing your account with others. If desired, you can combine both Sling TV Blue and Orange for $40/month. This gives you a larger set of cable channels, and allows you to watch on up to 4 devices at once (1 device for Sling Orange channels, 3 devices for Sling Blue channels). There is another drawback of all Sling TV packages, though. You don’t get a cloud DVR for free. You’ll pay an extra $5/month for the privilege of recording your TV shows, so the true cost is $30/month for Orange and Blue, or $45 for Orange + Blue, if you want a DVR. The DVR is not bad, overall – you get 50 hours of cloud storage, and there are no content expiration dates. The biggest drawback is that some channels – Disney-owned networks, for example – block all DVR functionality. Both Sling Orange and Blue will get you access to the same suite of apps. You can watch Sling TV on Chromecast, Roku, Apple TV, Amazon Fire Devices, and iOS/Android. You can also use your web browser, as well as LG/Samsung Smart TVs and the Xbox One gaming console. Sling TV is not without its drawbacks, but it’s still the cheapest way to watch TNT live without cable. If cost is your biggest concern, and you don’t mind either missing out on a DVR or paying extra for DVR service, it’s a fantastic deal. If you’re not sure about whether or not you’ll like this service, you can check it out with a free 7-day trial on the Sling TV website. Hulu With Live TV is a bit different from the other picks on our list. First, the service only offers one package of channels, which will cost you $39.99/month. The only extra channels you can add to your streaming bundle are premium channels like HBO and Showtime, and a more recent “Entertainment” add-on, which includes channels like DIY Network, FYI, and Cooking Channel. You get a total of 50-70+ cable channels, depending on your location. This package includes TNT, as well as A&E, FX/FXX, TBS, USA Network, and SyFy, as well as ESPN news channels like CNN. Notably, AMC is missing, probably as part of the ongoing (and hilarious) AMC-Hulu feud. The first reason is that your $39.99 membership includes a base-tier Hulu membership. That means you can access the entire archive of shows available on Hulu, from both top cable channels and network stations. You also get a great DVR included for no extra cost. You get 50 hours of total recordings, with no expiration dates, blocked content, or simultaneous recording restrictions. You can quadruple this storage to 200 hours for a $14.99 fee with the Enhanced DVR package. Simultaneous streaming is just okay by default. With a base-level package, you can stream on 2 devices simultaneously, tying this service with DirecTV Now, and making it slightly better than Sling Orange. You can unlock unlimited streams, however, with the aptly-named, $14.99/month Unlimited Screens package. If you choose this add-on, you can watch on up to 3 devices at once outside of your home network, and on unlimited devices inside your home WiFi network. If you’re really into Hulu With Live TV and need both unlimited screens and an expanded DVR, you can even bundle both of these add-ons together for a $19.99 monthly fee. Device support for Hulu With Live TV is pretty impressive, and has been improving throughout the beta program. Today, you can stream on web browsers, iOS/Android devices, and on Apple TV, Chromecast, Roku, Amazon Fire, and Apple TV. You can also stream on select Samsung Smart TVs, and all Xbox 360/Xbox One models, as well as the Nintendo Switch. If you are interested in both Hulu on-demand content and watching TNT without cable, Hulu With Live TV is a really good deal. For $39.99/month, you get plenty of cable channels and a good DVR, as well as all of the Hulu on-demand content you could ever want. However, if you don’t need a Hulu subscription, or want to stream on more than 2 devices without an additional fee, a different service like Sling Blue or YouTube TV may be a better choice for you. YouTube TV added TNT to its channel lineup in 2018. As this streaming service has continued to expand, it’s becoming a better and better choice for cord-cutters. Today, you’ll get around 70 channels from YouTube TV, for a flat, $40-per-month fee. For your money, you get a huge number of great channels, from sports channels like ESPN and Fox Sports, entertainment channels such as TBS and SYFY, new from CNN, MSNBC and BBC World News, and a number of other great channels. But that’s not all. YouTube TV also has great features, such as an unlimited 9-month cloud DVR. You can save as many shows as you want for 9 months with no other restrictions. And because you can create user profiles for up 6 different people, it’s easy to keep your stored shows organized. You also get 3 streams with YouTube TV, which puts it ahead of Sling, Hulu With Live TV, and DirecTV Now, just to name a few. Device support used to be a big issue for YouTube TV, and its biggest flaw. And while it’s still not perfect – the service doesn’t support Amazon Fire TV, due to a silly, ongoing corporate tiff between Google and Amazon – it’s gotten much better. Today, you can stream YouTube TV on your Chrome web browser and iOS/Android devices, as well as on Roku, Apple TV, and Chromecast, as well as many smart TVs from Hisense, VIZIO, Samsung, LG, and Sharp. The Xbox One console is also supported. It’s hard to beat the value that YouTube TV offers. You get a near-perfect channel lineup, including TNT, for $40 per month, alongside great features and reasonably good device support. The biggest catch is that, while it’s now available in most large cities, it’s not available everywhere in the country just yet, so there’s a chance it may not be an option for you. DirecTV Now’s biggest strength is its excellent selection of cable channels. Even if you choose the lowest-cost, “Live A Little” package for $40/month, you’ll get a fantastic selection of top cable channels. This base-tier package includes a total of 60 channels – you can get the full breakdown here. This package includes TNT, as well as just about every other major cable network, such as FX/FXX, Spike, A&E, USA Network, AMC, and TBS. You will also get ESPN, as well as some local FOX Sports affiliate networks. For the price, we think that DirecTV Now certainly has the best selection of channels available in any skinny bundle service. However, it’s not exactly our top pick for how to watch TNT without cable – for a few reasons. First, the DVR is very limited, offering only 20 hours of storage. This is, by far, the worst DVR option of any internet TV service out there, and until the summer of 2018, DirecTV Now didn’t offer a DVR at all. In addition, DirecTV Now also limits simultaneous streams to only 2 devices. You’ll have to pay $5 per month to add a third stream, and you’re still probably going to run into trouble if you intend to share your account with friends or family members in your household. But with good channel coverage and reliable stream quality, DirecTV Now is certainly not all bad. It also has good platform support which includes web browsers, iOS/Android devices, Amazon Fire TV, Roku, Chromecast, and Apple TV. With a good number of channels at a reasonable, $40/month price, DirecTV Now has some good things going for it. But for most viewers, its positive attributes are outweighed by its still-poor DVR service, and restrictive simultaneous streaming policy. If you’re interested in the service, you can get a free 7-day trial on their website and try it out for yourself. TNT is available on PlayStation Vue, with the $45/month“Access” package. This means that it’s the most expensive service on our list. However, PlayStation Vue does have some serious benefits that help justify its higher cost, compared to DirecTV Now and Sling TV. First, PlayStation Vue provides you with a very good slate of cable channels, even in the cheapest package. You’ll get TNT, alongside USA Network, AMC, TBS, TLC, FX/FXX, and SyFy. You will also get sports channels like ESPN, and a selection of cable news channels such as CNN and MSNBC. This adds up to a total of about 50+ channels, depending on your area. PlayStation Vue also includes a very good DVR service, for no added charge. You can only keep shows for up to 28 days – but other than that, storage is unlimited. You can store as many episodes or hours of content as you want, without any limits or restrictions. But we’ve saved the best for last. The very best reason to pick PlayStation Vue is its absurdly good simultaneous device streaming policy. You can stream on up to 5 devices at once with PlayStation Vue. That’s not a typo. If you’re on the same WiFi network, you can stream any channel on PlayStation Vue to 5 devices at once. This makes PlayStation Vue the best choice for larger families by a large margin. Only Hulu With Live TV offers a better simultaneous streaming policy – and that’s only if you pay $14.99/month extra for the Unlimited Screens package. PlayStation Vue is available on almost every streaming platform, with the exception of Xbox gaming consoles. You can stream content on your web browser, on iOS/Android devices, on Roku, Chromecast, Amazon Fire, and Apple TV, as well as any PlayStation 3 or 4 console. PlayStation Vue includes TNT alongside a great selection of other cable networks, for a pretty reasonable price. Its channel list, combined with great DVR service and an unbeatable simultaneous streaming policy makes it a really good deal overall. If you are looking to share an account with a large family, or with friends and roommates, PlayStation Vue is certainly the best choice. Solo streamers, however, are probably better off with a cheaper service like Sling TV. If you want to check out PlayStation Vue, you can get started with a brief 5-day free trial at their website. Sling TV is the champion in this area. You can get TNT for only $25/month with Sling Orange. Alternatively, you can pick the $25/month Blue subscription to stream on 3 devices at once, and to get a few more extra cable channels, though you’ll miss out on ESPN and other Disney-owned channels. Even if you do buy a $5/month DVR subscription, Sling TV is the cheapest way to watch TNT without cable. YouTube TV is our top pick. It has a better channel selection than Sling Blue + Orange combined (which also costs $40), and a fantastic DVR for no additional cost. Add in the 3-device streaming policy, and it’s a no-brainer. Hulu With Live TV is also a viable option if you do not need to stream on as many devices simultaneously. You will miss out on some cable networks like AMC – but getting free access to the entire Hulu library is worth that sacrifice.